Taconite is a low-grade iron ore. When the high-grade natural iron ore was plentiful, taconite was considered a waste rock and not used. But as the supply of high-grade natural ore decreased, industry began to view taconite as a resource. Dr. E.W. Davis of the University of Minnesota, along with other scientists and engineers, conducted years of laboratory tests and experiments to find a way to take the iron ore out of the taconite rock. After many years of hard work, a process was developed to create taconite pellets. 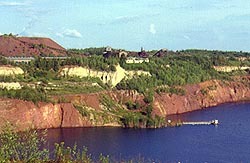 Taconite saved Minnesota's iron ore mining industry. Let's look at how the taconite pellet process works. Taconite is a very hard rock. Using explosives, the taconite is blasted into small pieces. The taconite pieces are scooped up by electric shovels. Each shovel can hold up to 85 tons of rock! The shovels place the taconite into giant dump trucks. These trucks are as big as a house and hold up to 240 tons of taconite. The trucks take the taconite directly to the processing plant, if it is nearby, or to train cars if it is far away. The concentrate (the wet taconite powder) is rolled with clay inside large rotating cylinders. The cylinders cause the powder to roll into marble-sized balls. (This is like rolling wet, sticky snow into balls to make a snowman). The balls are then dried and heated until they are white hot. The balls become hard as they cool. The finished product is taconite pellets. The taconite pellets are loaded into ore ships. These ships sail on the Great Lakes to Gary, Indiana, Cleveland, Ohio and other steel-making towns. The taconite pellets are brought to the steel mills to be melted down into steel. Taconite process photos courtesy American Iron Ore Association and Hibbing Taconite.